Workers of the Mazagon Dock Limited cheer after undocking of the first Scorpene-class submarine in Mumbai on Monday. Photo via The Hindu. India launched its first indigenously built attack submarine on Monday at Mazagaon Dock Limited in Mumbai, according to international media reports. 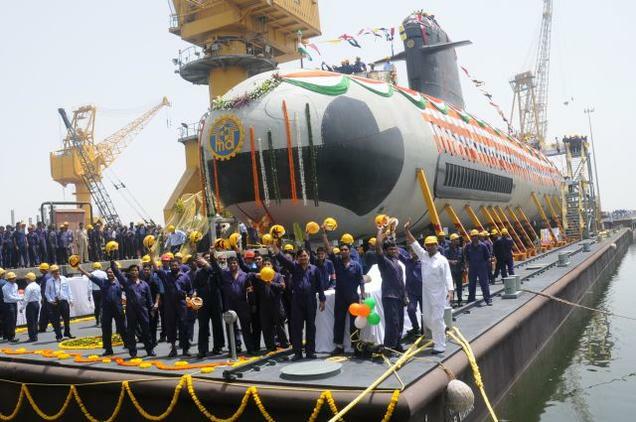 The French-designed, Indian-built Scorpene-class is the first of six diesel-electric boats (SSK) set to join the fleet over the next few years as part of the Indian Navy’s Project 75 in collaboration with France, according to India Today. The effort would modernize the Indian submarine fleet, which comprises nine Russian Kilo-class submarines, some as old as 30 years old; four German Type 209 SSKs; an Akula-1 submarine, Charkra, on lease from Russia; and one Indian-built nuclear-powered ballistic missile submarine (SSBN), INS Arihant. Arihant became the first Indian-built submarine of any kind when it joined the fleet in 2013, according to the U.S. Naval Institute’s Combat Fleets of the World. India’s NDTV reported that the sub is loaded with nuclear-tipped missiles and preparing for sea trials this month, ahead of joining the fleet in late 2016. The second sub in the class launched in 2013 and is expected to join the fleet later this year, according to Combat Fleets. The Scorpene-class attack submarines will be delivered every nine months, BBC quoted Parrikar as saying, with the last of the six subs inducted into the navy by 2018. Defence Minister Manohar Parrikar, Chief Of Naval Staff Admiral R.K. Dhowan, Chief Minister Devendra Fadnavis and others officials attended an undocking ceremony for the sub, expected to be commissioned by September 2016, India Today reported. According to Combat Fleets, the boat displaces 1,700 tons submerged, requires a crew of six officers and 25 enlisted sailors and fields up to six SM 39 Exocet anti-ship missiles.